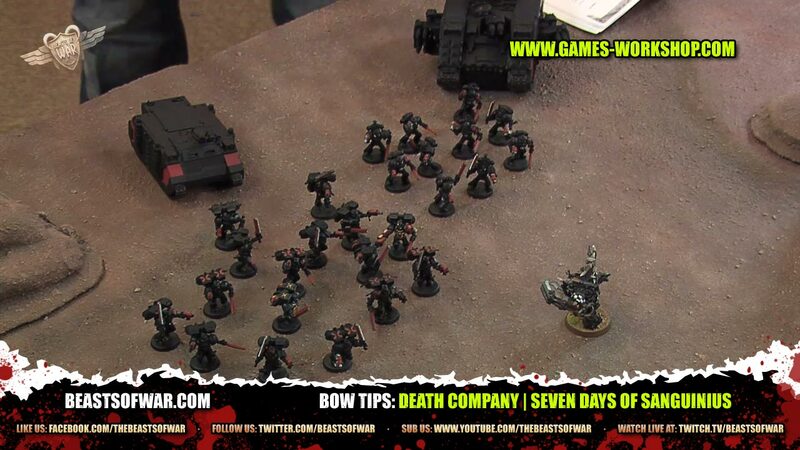 Warren and Darrell have a look at how Death Company work. I was looking in the rulebook under universal special rules, and it seems to describe the rage rule properly. It says the unit MUST move as fast as possible (max distance) in the movement phase towards the closest visible unit. Then in the shooting phase, they can choose to shoot or run but they MUST run toward the closest visible unit if they choose to run. 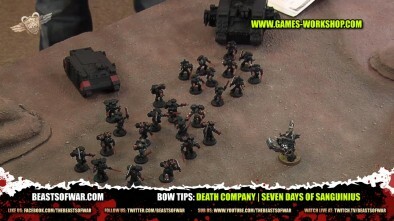 Then in the assault phase they MUST ‘consolidate’ towards the closest visible unit (so I would guess this means assault or move towards them 6in if you can’t reach them). So you don’t get a choice of which one you want to assault – it has to be the closest visible unit. But doesn’t consolidation happen at the end of the assault phase after all assaults are resolved? Because since it says they must consolidate it sounds like they can still choose who to assault, but after the assault (when one unit comes out the winner in that assault) when they have to roll for consolidation they have to consolidate towards the closest visible enemy unit. Not saying that I am right and you are wrong, just saying what I seem to interpret from the rules you have written in your comment. iv got it in my hed that with a chplain rage no longer ffects them but i cant find where i got that from now =S can some one clear this up for me? I really miss the option of putting them into a storm raven bird and fly them in, in this video!